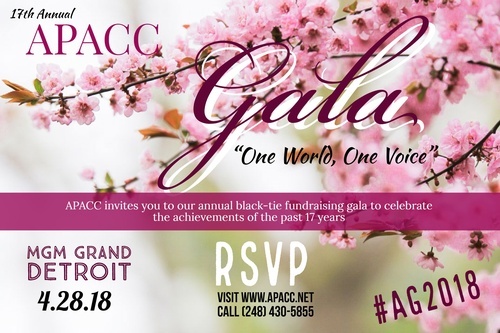 17th Annual APACC Gala "One World, One Voice"
Name: 17th Annual APACC Gala "One World, One Voice"
You are cordially invited to join APACC at our annual fundraising gala along with our founding members, sponsors, entrepreneurs, and civic leaders to celebrate the achievements of the past year. Please join us as we take a look back at 17 years of APACC and celebrate all the accomplishments and milestones. Featuring silent auction, door prizes, and amazing performances! To become a sponsor or for additional information, please contact us at 248-430-5855 or alysia@apacc.net.